Blane De St. Croix’s research-based practice incorporates on-the-ground site visits, aerial fly-overs, photographic documentation, interviews, internet mining, and satellite imagery to create art that investigates local and international social, political, environmental, and cultural climate challenges. 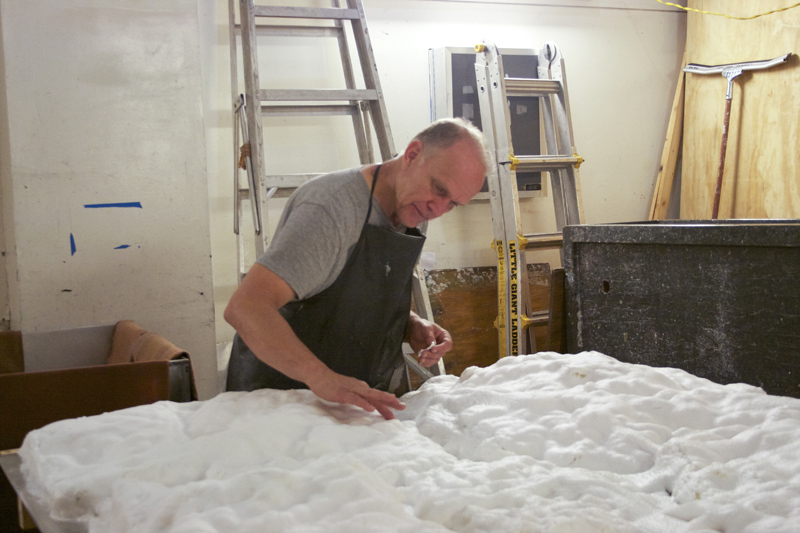 He created two distinct bodies of work while in residence at Dieu Donné that emulate natural phenomena of snow and lava using processes innate to pulp and papermaking. The two series of low-relief modular wall works are based on the artist’s research trips to the Arctic Circle and the Hawaiian shield volcano of Kilauea, respectively. 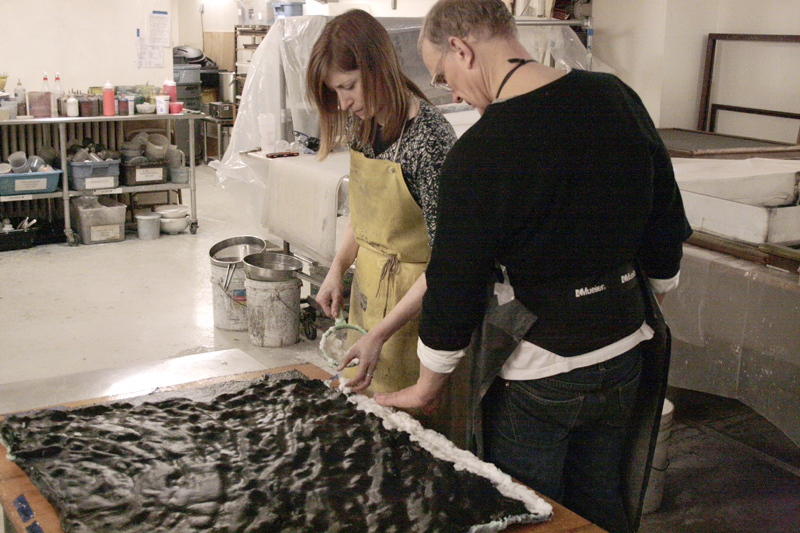 Landscapes based on images and memory were re-created with foam – a light, malleable, and waterproof material – to use as an armature for sheets of cotton pulp in black made with carbon pigment and natural white to emulate lava and snow. 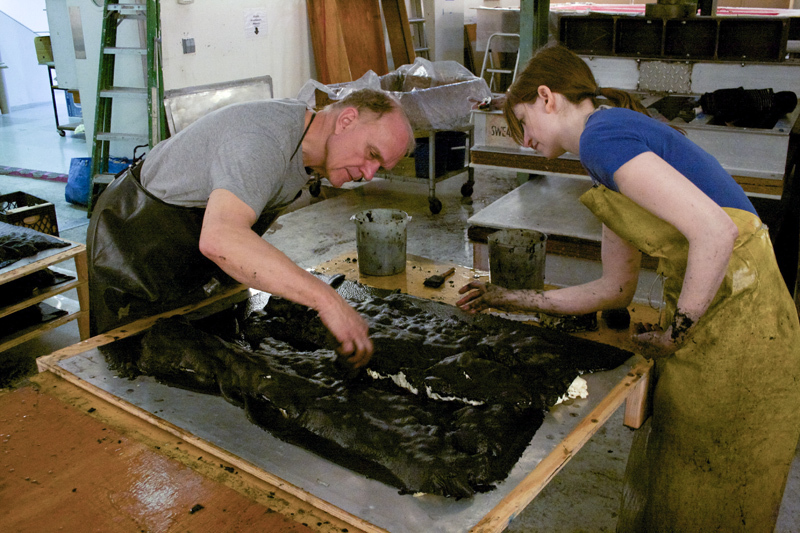 De St. Croix and his studio collaborator Lisa Switalski pulled large sheets of paper and almost immediately laid them over the armatures. Thick sheets of paper are usually left to drain and be pressed, as the strength of the sheet depends on careful timing of its transfer off the screen. Instead, the supersaturated sheets lost the integrity of a regular sheet of paper and collapsed around the armature as the pulp peeled off of the paper screen, the movement emulating nature. 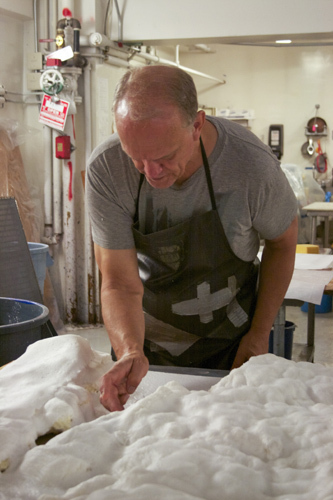 In another twist on regular paper making, the works were air-dried quickly, rather than a slow restrained process. This intentional loosening of control allowed more serendipity in the resulting pieces, leading to rich surface textures and tears, allowing the natural state change of the material to direct the final work, from wet to dry. I was honored to receive a Dieu Donné Workspace Program Residency, which was awarded at an important time in my studio practice. Cast paper is an exciting new medium for me and seems to be an extraordinary match to my existing art practice. The possibilities presented by the material have greatly enhanced my creative process. Paper pulp has truly transformed my work. I am extremely grateful to my studio collaborator, expert papermaker Lisa Switalski, and the entire staff at Dieu Donné. They worked tirelessly to provide a perfect work studio environment for the production of my projects. I would also like to thank my wife Diana Shpungin for invaluable creative insight and interns from both my studio and Dieu Donné for all their efforts on the project. Born in Boston, Blane De St. Croix was educated at Cranbrook Academy of Art, Bloomfield Hills, MI (M.F.A. Sculpture) and Massachusetts College of Art, Boston, MA (B.F.A. Sculpture with distinction). De St. Croix lives and works in Brooklyn, NY and Bloomington, IN. He is represented by Fredericks & Freiser.